Electronics and Instrumentation, Volume 35: Modulation, Resolution and Signal Processing in Radar, Sonar and Related Systems presents the practical limitations and potentialities of advanced modulation systems. 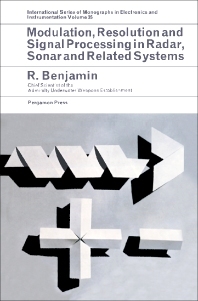 This book discusses the concepts and techniques in the radar context, but they are equally essential to sonar and to a wide range of signaling and data-processing applications, including seismology, radio astronomy, and band-spread communications. Organized into 15 chapters, this volume begins with an overview of the principal developments sought in pulse radar. This text then provides a discussion and analysis of a wide range of various modulation systems. Other chapters consider the intrinsic Doppler resolving power of a radar system. This book discusses as well the power illuminating a radar or sonar target that may be comprised of one or more discrete pulses. The final chapter deals with the transmitter-modulator circuits and valves. This book is a valuable resource for electronic engineers and scientists. (b) Doppler Tolerances for Linear f.m. and Pseudo-Random "Noise"